Years ago, Rabbi Kushner wrote a book called: “When Bad Things Happen to Good People.”I have been doing some research upon the subject of “Why Bad Things Happen to Good People. ?” Don’t many of us ask WHY? Upon request, I will send you a copy of this research. It does not fit the pattern of “Wealth, Health and Prosperity taught by many media evangelists that we hear from almost daily. Send your request for this free study to: ​info@pathways2living.org​. This body and all creation is groaning for the manifestation of the sons of God. Our body longs to be clothed upon by a body which will not be subject to sickness, suffering and disease. May God bless each one who researches this site. There is much to learn. Some we are ready to hear and other things will seem new and strange to us. All I ask is that you read with an openmind and allow the Spirit of God to speak to you. Pray for a productive life. 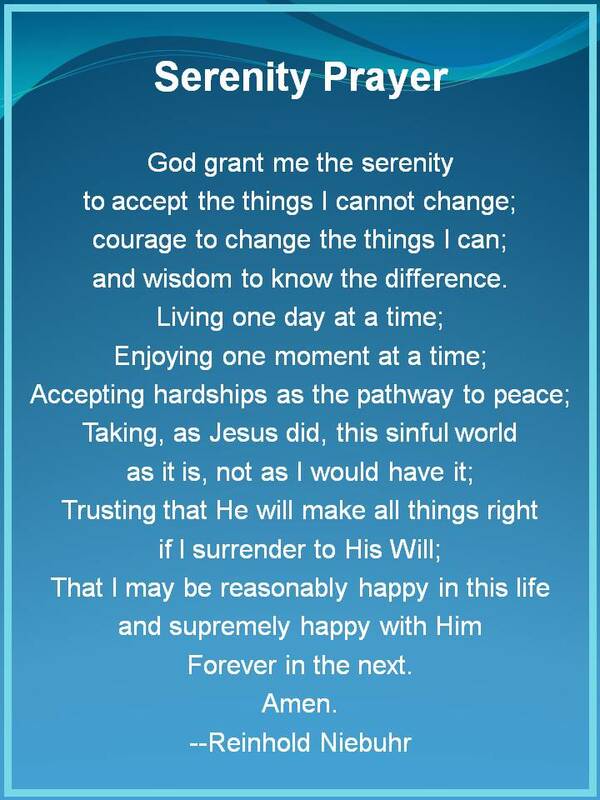 Many of us have learned the Serenity Prayer. It is widely used in 12 step programs. But, I have never seen it in its entirety. Here it is below. Think of two oxen which are joined in a yoke. One cannot go at a different pace than the other. One leads and one follows but they walk in harmony and therefore are more useful to their master. Both, cannot go their separate ways but must learn to walk in unison. Rebellion against the lead animal only chaffs the neck and damages the newer animal until he learns to surrender his own will to the other. Come to God all you who have a broken and contrite heart. There is pardon for your guilt and a “heart transplant” for your broken and beaten heart. When you think you have reached the bottom and acknowledge your helplessness to change things; the Creator God becomes available to show you the way out. Let us talk about pathways. There is the wide path that leads to destruction and many will travel this way. Not much is required of you as you hang around with your “friends”. This is the time when you find out if you even have friends. How deep were the surface relationships? When you really need help, where are they? What is needed is a “friend that sticks closer than a brother.”. Today's mocking world of empty relationships and unworkable life skills will leave you feeling how worthless your world has become. This kind of life does not demand much of its followers. . You think you can get away with a lot more in life by taking this wide path. The world is full of artificial highs and causes us to sink into unbelievable loneliness on the downward drag. This path is compressed and our lives are in a total vacuum. We search for meaning in life but find only more emptiness. Nothing in life seems easy but rather pressurized torture meets us at every turn. We wonder just how much more we can endure. Some say they are ready for the “funny farm”. Some have just decided to drop out. They drug away their sorrows and try to create a new reality that is livable. Some even decide to go homeless because it brings the necessary pressures down to a level they think they can handle. But, far too many end up trying to end their life. They have had enough and they just can't take it anymore. For more help with this spiritual journey, check “Freedom in Christ” above. Written by Henry N. Willey, Jr., D.D. Is it not on the minds of most? Then why with frivolities be engrossed? But, “Self” has taken His place. That once would redden our face. But, much of what’s done makes me bored. The one you thought would never come. The charges will be read: every one. Those who stand there, will be struck dumb. Now every behavior, the angels recount. While some will go to the right. Will hide from the searching light. The choice was yours but now its too late. No second chances will be given. The other to the joys of Heaven. God knows your heart’s cry. Surrender control of your life. Quit the emptiness and strife. The direction it will go is your choice. But with God on your side, you can only rejoice. Who shall be able to stand when He appeareth? “Be thou faithful unto death and I will give you a crown of life. What kind of person are we to be? Called out of the world and unto the Lord and His people. The process of Sanctification or becoming Holy is a process entered upon at the new birth or conversions experience. The above verse says that Christ set us free from the sins that so easily make us stumble. He frees us for the habits of the old man/or woman. The person you used to be before God changed your life. He will continue changing lives as the people look into the perfect law of liberty and are changed from glory to glory. There are babes in Christ, there are young men and there are elders. The Christian grows into these stages. We see what is required of God as seen in the Scriptures and as we submit to the teaching of the elders. When we receive a new incorruptible body as the resurrection of the dead, the body that was subject to decay and deterioration is changed to be a new body that will not get sick or die. “We shall be like Him, for we shall see Him as He is.” Flesh and blood cannot enter Heaven only resurrected bodies will inherit all God has for us in that Heavenly home. We can be assured of our future when we accept the free gift of God’s love and care. It was His blood alone that opened the doors for us. It is not be works that we have done but according to His mercy He saved us by the washing of the water and the renewing of the Holy Spirit. No one will ever make Heaven because of their good works. Good works are an evidence of the indwelling Christ. “Faith without works is dead” Works are important and will be rewarded on that day the Lord tries our very souls. Did we build our lives on wood, hay or stubble or did we use Gold. Silver and Precious stones. The refiner’s fire will reveal just what you did with the gifts God has given you. “You have not chosen me, but I have chosen you” to bring forth fruit fit for repentance. The Call: Jesus said over and over “Follow me”. Do not get ahead of His leading or fall behind. I Thes.4:7 “For God did not call us to impurity but in holiness”. Possessed by: The Holy Spirit comes into the heart and life then they will only have a change of mind, refusing to be around. When we respond to the calling God has on us, our thinking changes and our behavior radically. God demands a holy life. What is the life of holiness? It is a state of purity and sanctification. A very similar word which is actually the root of the above means “To be consecrated, separate, be holy, purify and consecrate unto a holy cause. The separation comes in as we are called to be a special people whose lives are full of good works. We are to hold fast to what God has given us and not to deny the Truth that is in Jesus Christ. This month, I would like to share with you one of the most important lessons in the Scriptures. It has to do with “Forgiveness”. There are more people in dysfunctional relationships, sick or dead because they cannot get this one right. The person that you refuse to forgive is living it up but if you refuse to forgive, it is like worms working their destruction throughout the entire body until it finally destroys you. It always hurts the unforgiving more than the one you refuse to forgive. People carry hard feelings for years and sometimes they don’ t even recall why they are angry and unforgiving: remember the legendary feuding Hatfield and McCoy’s? The following is an absolute truth as told me by a Southern Baptist Deacon back in 2008 at the Cordes Lakes, Arizona SBC. If he is still alive, you could contact the church for verification. Our Deacon friend was in a business partnership with his brother. The business did quite well but our deacon found out his brother had siphoned off a large sum of money. The losing partner got extremely angry with the thieving brother. He got so angry that in time he developed more and more sickness and finally Multiple Sclerosis (M.S.) The crippling effects got worse and worse until he had to be carried from room to room and was totally helpless in every way. Then, came the insight that he really needed to forgive his brother unconditionally. The deacon got through to God and his brother and forsook the hard feelings and hatred built up in his heart. When I met him, his M.S. was cured. He could walk without assistance and was in excellent health. I asked him to repeat the story several times because it was hard to believe the power of forgiveness in our lives. What a powerful lesson that was. Let the power of his story work its way into your mind. Many of us are holding something against another person. Harsh words have been said. Perhaps , we were not even aware that we caused ill-will to the other person. Hurt feelings build into grudges and grudges into hatred and hatred can lead to murder. Haven’t you heard of some senseless killing over some insignificant upset, anger and then anger worked out into killing the offender. Evil words have been spoken and never made right. We offended someone. Someone was actually or was perceived to be offended or had their feelings hurt. “Our Father (Greek denotes a close personal relationship). Peter asked the Lord: “How many times Lord should I forgive my brother? Seven? No. No, the other person may not deserve forgiveness. Either way, deserving or not. You must forgive. Even when you think it was not your fault: apologize. Literally a life of sickness awaits those who refuse to forgive. Don’t let unforgiveness keep you from Heaven, it seems quite clear in the Scriptures. Thank you for all of your support. We are back and ready to answer your questions. Please limit your questions to 250 words or less and note that all comments and questions will be moderated. Please create a login and feel free to get involved. Welcome to those of you who are searching to find a life beyond the mediocre. Maybe, you have discovered your life is far from exceptional and is just like too many others living with confusion, doubt and mild terror being overwhelmed with trying to live life with too many demands and too few dollars. For some of us the issue is survival just for one more day. You have been looking for resources and friends but are treated like a non-person. This group was created with you in mind. Do any of these kinds of these challenge you? 1. I am unsatisfied with my present level of social involvement. 4. I am finding it more difficult daily just to put up with my life as it is. 5. I often feel like I just can’t put up with it anymore. 7. I feel a spiritual vacuum within my heart. Something is missing. This group has radically changed for 2014. We originally tried to provide tools and resources for those struggling with mental health issues. But, the further we got into trying to help these people, the further we ran into problems that just didn’t make sense to us. Society has suffered because of our kind of life: The child is born and almost immediately taken to nursery, day school, preschool and then thrown into the educational system having no care and nurture from their parents These kids are often raised by an overworked, exhausted single parent. Kids need parents. Two of them. But, no matter the reason, you are accepted here.. If you could talk to a teacher, I am sure you could get an ear full. Children grow up like weeds, unattended and self-taught. They are unprepared to live in society. What they do learn is often based on positive or negative reinforcement of their current behavior. Society teaches them and often that can be a tragedy. We must ask ourselves, before the crisis comes, who am I going to turn to? Many of us do not have close families. The tendency is to isolate and so more and more electronic devices change our way of communicating or communication is non-existent. We need a real human person who is warm and alive. Early society went to the debates and the subject was usually religion. Some are still fighting. Then, the church became the social network center in the 1950’s. But, steadily, people are not finding what they need in the many entertainment centers that some churches have become. Religion is scrambling to reach those that they have lost. The feeling is that if they can make church more like the world that people will come on over. So, now we have loud radical noise that passes for music. What is it we really need in life beyond the basic survival needs? To be able to get along with people better. To be a more loving person…. We need to look for life and character/personality issues to a different source. We have taken our broken lives and tried to patch them up from time to time with poor success. What we really need is to find a whole new way of living. Somehow, most of us seem to be on this kind of a quest. There is hope for an entirely new kind of life and it is so simple to find. Come grow with us. Find new friends. Discover answers for the questions you didn’t even know how to ask. Welcome to the group. 1. We will always try to help those living with life-controlling problems to become mentally sound and reasonably alert. 2. Through mutual communications with other members, we will help each other to be emotionally balanced and in control of our emotions. 3. Individually, we will attempt to become socially adjusted by avoiding isolationism and involving ourselves in the community of our choice. ourselves and finding better ways to maintain wellness through healthy living. discovery and daily advancing towards spiritual maturity. 17 Therefore if any person is [en-grafted] in Christ (the Messiah) he is a new creation (a new creature altogether); the old [previous moral and spiritual condition] has passed away. Behold, the fresh and new has come! The past few months have been times of great trials, distress and testing of our personal and spiritual resolve. I wonder what your experiences have been. Members of this group are welcome to post messages regarding your own personal experiences. You may use this medium to share those perplexing problems that you may be facing; tools you have found helpful; and uplifting items of interest. We have members spread throughout the globe from Java, Indonesia to the most modern cities we know. Of course, many of our experiences will be vast and varied yet much of the human race holds many things in common. Enter a blog telling us about your location; what you do? How old are you? How could this group become more useful to you and your friend? The leadership here is eager to change and improve the website to make it into something that will meet your needs and open outlets of free and open communications. The world is changing every day. Your country; your occupation, the common flow of life is changing so radically that our heads seem to keep spinning. Some of us need someone we can relate with. Perhaps you need or can give advice. Your views are important and may be voiced here. On a personal note: As founder of the group, I can hardly believe the changes in what we had intended the group to be and as it is headed. I am looking for leadership who can work together and re-make the group. I just turned 70 years old and I seek younger blood, fresher concepts and a progressive vision. Full partnerships could be arranged. Anything is possible. What would you do if the group were yours? Let us hear from you. We have never asked for money so that is not the purpose. Wow, here it is a brand new year. It seems this last year flew by in some ways. I hope it has been a good year for you. I am ready to see what new and wonderful things like ahead. Learn to thrive on challenges and not cave in. Together we are stronger than the sum of our parts. Some of us have had about all we can handle to keep going. We have kept our sanity and even learned a few new tricks on survival and recovery. We have faced unprecedented financial and emotional pressures. But, we have survived. We have had some miracles this year. An anonymous donor paid for five years of website service for the organization. I personally do not think I will be around that long but then we get surprises every now and then. I have been honored and privileged to have Les Levenson as my business partner from the start. He is on the east and I am on the West but it works out fine. I have never met anyone that seems to be able to keep his cool and positive attitude as well as Les. We got acquainted several years ago when he called me for some advice on running his Depression and Bipolar Support Alliance Chapter. I had been very active with DBSA at that time. The years have past by pretty fast, now, of course I am retired and no longer able to do my DBSA efforts. They have all been given to others. One never knows what good he may have done during those years working as a consumer advocate and involved locally, regionally and nationally. Some will look back and love me and some will not remember me so kindly. But, that is life. We just try to do our best and only in the final day will we know how things turned out. Was all that effort worth it? Who can know? There have been several mass murders this year and it always seems to come out that “they had a history of mental illness”. Of course we don’t need this kind of negative press. It tends to educate the publicly wrongly with the idea that we are all dangerous when in fact, those of us diagnosed with a “mental illness” are no more likely to harm as to be harmed. Nevertheless, the news is not good. My friend, Dr. Dan Fisher, M.D., PhD. and also a peer happens to be the same age as I. He is still carrying on strongly. Dan and his confederates have put together a program called “Emotional C.P.R.” . More peers need to come forward and fight for our human rights or we will end up with fewer and fewer while they incarcerate more and more of us. Without your getting involved, things will not go well for us over the next year or so. I know for some of us, it is all we can do to just maintain. Life is often more than we can bear. But, somehow with the grace of God, we do not only survive but thrive. I ask each of you to take ownership of this website. Help us know what you would like to see us become. We want to offer help and resources to enable you and your families to achieve the most that is possible. Don’t measure yourself with anyone else. Some of us can do more and some less. we need to find out how to do some behavior modification programs. We ask for more input from each of you to help us promote spirituality and the power to overcome whatever life hands to us. We are able to face it with confidence and be more than conquerors. He is a wise and intuitive co-worker who speaks his mind and is at the same time open to new ideas and listens weighing the merits of each idea. He presently works in Apache Junction, AZ. He is a peer counselor assisting all those with whom he is brought to. He also lives with bipolar as do I.
Joel’s articles on Suicide are provocative and challenge old entrenched ways of thinking. Suicide is a very complex issue and there are many people working on bringing the numbers down. The high rate of military suicides troubles us all. His first article was written a few years ago and so he mentions the DSMIV which has no been replaced by the DSMV (Diagnostic and Statistical Manual of Mental Health) This is put together by the American Psychiatric Association as a means of revenue and status. Every therapist uses this to standardize diagnoses. The trend is for more and more diagnoses. Madison Avenue and Big Pharma conspire to create new diseases and since they look at each one as a medical condition, the answer is usually more and more medications. DSMV and the American Psychiatric Association have been under attack for their latest over-diagnosing. Their credibility is also in question. But, this is the standardized manual when they give you a label or several. As far as cures for any of these diagnoses, you will not find them offered. The one and only treatment is pronounced as being chemical interventions. Our site hopes to offer recovery for mental disorders. People can and do get better and this is what we want to promote. We also want to see more alternatives to drugging. The whole person is what needs to be looked at and we hope to be able to offer alternative methods to make you feel better. We are not medical professionals so do not look at anything we say as being medical advice or treatment recommendations. We are all peers. All of us are struggling with some condition. Some of us may have similar or the same diagnoses and we can share successful tools we have discovered on our own. I read the messages of several of the groups that I am in. The people want to self harm. They want to die. They have no hope and see the world as hopeless. I, too, would feel like that except that I have found Jesus Christ to be the anchor of my soul. I find that He gives me peace amid all this daily trash we hear and see. If it were not for Him, it scares me where I would be or what I would be doing. I am sure it would be self-destructive just like all of these empty hurting people. It overwhelms me just to hear your stories and knowing that I cannot change your mind-set. I know that my God is the answer to your needs but how do I convince you? How would you sit still long enough to hear…. You would think of “religions” and want no part of TV evangelists, Rich preachers and scam artists. You’re right. No one would want that. It is a fraud a counterfeit. But, I do want to tell you there is hope. You will find Him when you get desperate enough, when you call out with your whole being for the reality that He is. He is looking for you and near you and just being a gentleman who will not force himself on someone who does not want Him. So, the choice is really yours. Continue living in the cesspool of daily life, or change it. Yes, you can change your world and not have to bail out. Too many are choosing that path of self-harm or suicide. It is a permanent solution that causes God such pain. It causes His people real pain because somehow we did not reach you with the truth in a way you could respond to. In the end, the choice is always yours. I hope you make the right choice. These have been times of great transitions for me personally and for the group I founded one year ago. So much has happened and so many of you have checked out the site and found it good or bad depending on your opinions. We have not gotten many comments so sometimes it is hard for us to know how we are doing as a group. The major change in the group is that we have decided to begin addressing the whole person in our approach to recovery and wholeness. So many times, the literature and messages have been aimed at “Feelings” and not on the spiritual part of man. Through approaching the subject of rightly relating to our Creator and His world we are hoping to find answers that others have not even considered discussing. The personality of man is composed of Body, Soul and Spirit. A psychiatrist or psychologist might be termed a “soul doctor” because that is the realm in which they deal. The soul being: emotions, intellect and will. Many people today have a real deficiency in their spirituality and that is the root of many of their dysfunctions. Spirituality is not a taboo subject for our new group. We are free to talk about how relationship to God and others. We are free to discuss the ways in which the Bible instructs us to live. Religion is a dirty word for so many because of the images it pulls up in our minds. So, we will try to steer clear of religious organizations, sects or man-made organizations. What we can and should discuss is what is required of a spiritual man or woman. We will not allow arguments or foolish discussions on opinions or doctrines that have puzzled the theologians for years. Let them continue their discussions. We seek truth in ways that we can realistically apply it to our daily lives. How can “spirituality” keep us from being suicidal or wanting to self-harm? How can all this that we discuss boil down to practical living? This is what I hope we can discuss. Please feel free to comment and to submit blogs or essays on spiritual truths. Although, websites cannot be Christian because only Christians can be Christian nevertheless the content on this group will be limited to Practical Christianity. No denominations, no sects, no organizations. We are just a group of brothers and sisters seeking more light and truth with each other on the spiritual path.